With terrorists increasingly attacking so-called soft targets, the demand for detection dogs that can sweep large areas for explosives has soared. So have prices, which can top $25,000 for a single dog. Security experts warn that the supply of these dogs is dwindling worldwide and that the United States is especially vulnerable because it relies primarily on brokers who source dogs from Eastern Europe. Technological alternatives have proved inadequate. Despite decades of trying, researchers have yet to develop a machine as exquisitely sensitive and discerning as a dog’s nose. Nor can a robot rove with the agility and ease of a dog. Spend time at the Transportation Security Administration’s (TSA) sprawling National Canine Training Center at Lackland Air Force Base in San Antonio, Texas, and you’ll be struck by the intensity and intelligence of the four-legged students. Rushing around mock airport terminals and train cars, the dogs abruptly sit, eerily still, when they pick up a whiff of explosives planted on one of the actors pretending to be passengers or secreted in an abandoned suitcase. And all the dogs want in return is a tennis ball or squeaky toy. The TSA has 1,000 dogs (German shorthaired pointers, German shepherds, Belgian Malinois, Labradors, golden retrievers and Vizslas) in its workforce and needs to acquire 350 new dogs annually to replace those that age out at 8 to 10 years old. To do that, TSA agents make quarterly buying trips to Europe along with buyers for the U.S. military, which has about 1,600 dogs deployed worldwide. They are competing with buyers from Customs and Border Protection, the State Department, various federal and local law-enforcement entities, private security companies, agencies requiring search-and-rescue dogs, companies in the hospitality industry that need dogs to sniff out bedbugs, health care providers that use dogs to sniff breath, blood and biopsies to make medical diagnoses — and, of course, foreign governments. “The top dogs bred globally go to whoever has the most money, and that’s likely the Chinese and Saudis,” said Scott Thomas, who resigned from the TSA last month after 15 years. For 10 of those years, he oversaw the agency’s breeding program, which was eliminated for budgetary reasons in 2012. The remaining five years, he worked with vendors to procure dogs. He is now starting his own detection-dog breeding and training consulting business. According to the TSA and the Department of Defense, the transactions occur mainly in Germany and the Netherlands, but the dogs come predominantly from former Eastern Bloc countries like Croatia and Romania. The region has a long history of breeding and training working dogs. Competitions that test dogs’ obedience, tracking and protection (bite and hold) capabilities are popular weekend sporting events there and the furthest thing from the U.S. notion of a dog show characterized by poofy purebreds prancing around a ring. “The supply of working dogs in Europe is strained from all the demand,” said Erik Wilsson, an animal behaviorist who retired in June from his job managing dog breeding for the Swedish Armed Forces. “The U.S. is buying a lot of dogs and, for sure, you’re not getting the best ones. It’s not about finding the dogs you need; it’s finding the good dogs,” which countries like Germany, he said, are keeping for themselves and breeders in less prosperous countries sell to the highest bidder. It’s why, Wilsson said, Sweden in 2005 reinstated its military dog-breeding program, which had been disbanded in the ’90s. “The program was brought down because decision-makers thought private breeders could do it, but after a couple of years, the military and police had huge problems finding high-quality dogs,” he said. Indeed, TSA agents and U.S. Army officers who go on overseas buying trips say they are lucky if they look at 110 dogs and have 50 pass their preliminary behavioral and medical screenings. Of those dogs, 15 to 20 percent don’t make it through training in the United States to be put into service. The ones that wash out are shopped to other agencies or put up for adoption. “We are looking for the SEAL team of dogs,” Thomas said, referring to the Navy’s elite special forces unit. 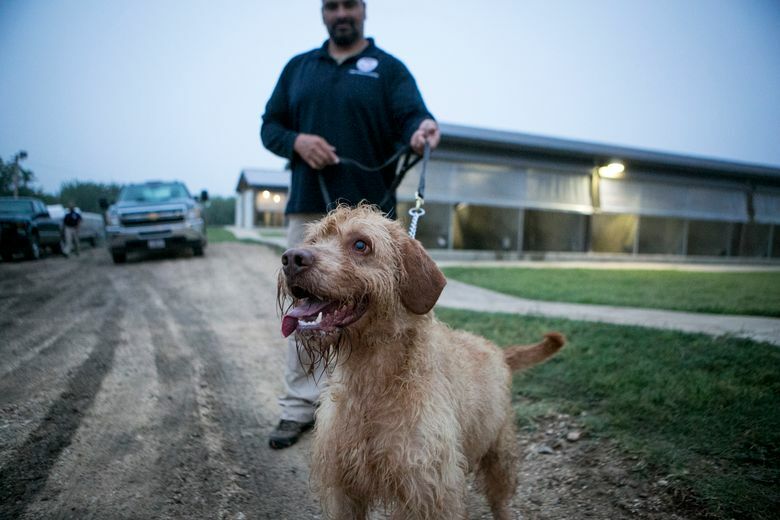 The American Kennel Club convened a conference this year to discuss the possibility of creating a cooperative of private dog breeders in the United States to provide the military and law-enforcement agencies with high-quality dogs. Another idea that is gaining traction is to have a large federally funded breeding program, akin to those run by nonprofit service-dog organizations like Canine Companions for Independence and the Seeing Eye, which annually produce 900 and 500 dogs, respectively. Those puppies are raised for the first year or so by volunteers, to make sure the dogs have good early life experiences and exposures. Talk to those who work with or study detection dogs and they express a kind of awe for the dogs’ capabilities.